Roller furling allows you to spend less time folding or changing sails and more time on the water sailing. Furlers have become a reliable, easy to install, industry standard found on many performance racing boats as well as necessary gear for cruisers. This brief synopsis will give you an idea of what to expect when installing a new unit, no matter what brand you choose. The basic components to a furling system include foil extrusions, a feeder, the upper swivel (in most systems-but not all), the lower drum assembly and a furling line. Most manufacturers include all the components needed for installation, but you may have to buy furling line, line hardware and a headstay terminal separately. Some furling units will require you to cut your headstay while others will use your existing stay with no modifications necessary. You may also need a halyard restrainer, which keeps the halyard from wrapping around the forestay, or a toggle or link plate at the base to raise the unit clear of a windlass or bow pulpit. Make sure to order the necessary terminals or kits to complete installation. Your sail may need to be modified to work with your new furler. You can convert your jib by having a qualified sailmaker sew in a luff wire or bolt rope, but you may be much happier if you spring for a new, properly designed headsail that will keep its shape when fully or partially deployed. Talk to your sailmaker about which furler you are buying and how you intend to use it. All systems include detailed instructions, but installation may be a handful for the amateur. If you are uncomfortable with measuring, removing, and re-installing your headstay, hire a professional rigger. Many manufacturers require that you purchase a terminal separately. A rigger with special equipment must install swage fittings, but a Hi-Mod®, Norseman® or Sta-lok® terminal can be installed without special equipment and come with detailed instructions. If your headstay is older than four years when you install your furler, it is best to have a rigger make you a new headstay with the required terminals. The sizing of your furler is based on your headstay length, maximum wire and clevis pin diameter and turnbuckle size. Measure your headstay from pin-to-pin with the turnbuckle set to the correct length before measuring. If you are using your existing stay, you may have to cut your stay to length. Most manufacturers provide a detailed guide to determine how much wire to remove. When you've made your calculation, make a clean cut using wire cutters or a hacksaw with a fresh blade. Next, lay out all the parts that come with the furler organized in order. Choose a spot on the ground free from dirt and gravel or sand, like the dock next to your boat. Depending on the unit, you may be instructed to slide components onto the stay in reverse order. Harken units assemble in this way beginning with sliding the top foil cap and all extrusion connectors up onto the stay first before the lower terminal is attached. The foil sections slide on over the connectors and are attached with a wedge, set screws and Red Loctite. Before attaching the bottom extrusion, slide the top swivel onto the foil, attach the feeder, and then slide the torque tube on. Next, install your terminal and attach the bottom foil. Now you can assemble the drum. Other manufacturers will have you start by feeding components onto the stay so they slide down to meet the lower connection. Disassemble the lower drum and slide the lower swivel and torque tube assembly over the stay and down to the bottom. Slide the first extrusion on and attach the feeder. Slide each extrusion over the stay connecting sections with the supplied joints or connectors and fasteners. The last piece of extrusion at the top may have to be cut to size. When the extrusions are in place, slide on the upper swivel. Make sure it runs smoothly over the extrusion connections so the sail will hoist easily once attached. Add the top cap to the top extrusion. If you don't have a top swivel, you may just have to attach the top cap and start working on your terminal connection. Once your terminal fitting is installed, you are ready to raise your furler into place using a halyard, friends and a bosun's chair with you in it. Place the lower end of the system inside the lifelines, attach the unit to the chainplate and lift using a halyard at the top end. Make sure the upper swivel is resting at the bottom to avoid it crashing down in the process. Connect the upper clevis pin. You may need to open the turnbuckle at the drum to make reattachment to the mast easier. Finally, it's time to rig your furling line! Furling line and hardware either come with your unit or are offered as part of an optional kit. Lead the line aft to the cockpit through a series of blocks. The line should come off the drum perpendicular to the headstay to avoid line chafe and reduce friction. This is done by careful placement of the first block. After the line is led, hoist your sail and you are ready to furl! Modern roller-furling systems are more reliable and easier to install than ever. 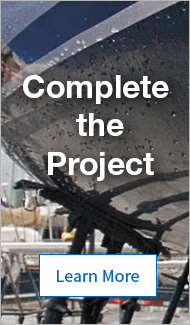 You'll save money by installing it yourself and minimize your time spent on the foredeck, making sail handling an easy, one-person job. Happy sailing!